Well look what we have here, make up. More specifically, new make up! That's right, lil' old me finally got her act together and went slightly spend crazy one night whilst browsing the interwebs. You do it too, don't deny it. So yeah, I probably should be doing less spending, more saving up for things like, a car and car insurance, those boring things we have to do in life but ya know what... I haven't bought a bunch of new make up in frickin' ages. Months in fact! I know, I can't believe it either. I'm also gonna switch it up over here and share my first impressions of what I picked up too because I do in fact have all the products on my face right this second. Now brb while I grab my list of initial thoughts from the notes on my phone. I'm very dedicated. + Nivea Post Shave Balm // £3.52 Ok, if you're reading this and you haven't heard of everyone and their mum using the post shave balm as a primer, then get out from whatever rock you've been hiding under and keep up! I mean that in the nicest way possible of course. I've been meaning to pick this up for bloody ages but I just forgot. Too many products on the mind. + Revlon ColorStay Foundation // £12.99 I've been toying with the idea of getting a high end foundation for ages but at the moment, I cannot justify spending that much on one product. I love a good bargain so I'll be sticking to drugstore from now on, which is where the Revlon ColorStay comes in. Having never owned a full coverage foundation before, I was curious as to what I'd make of this but I think it's my new fave. Soz L'Oreal True Match, you'll always be bae. + Maybelline Age Rewind Concealer // £7.99 Yet another product that I have been meaning to get my hands on for a while but for some reason the light shade is forever out of stock! But never mind, I have it now and it was worth the wait. 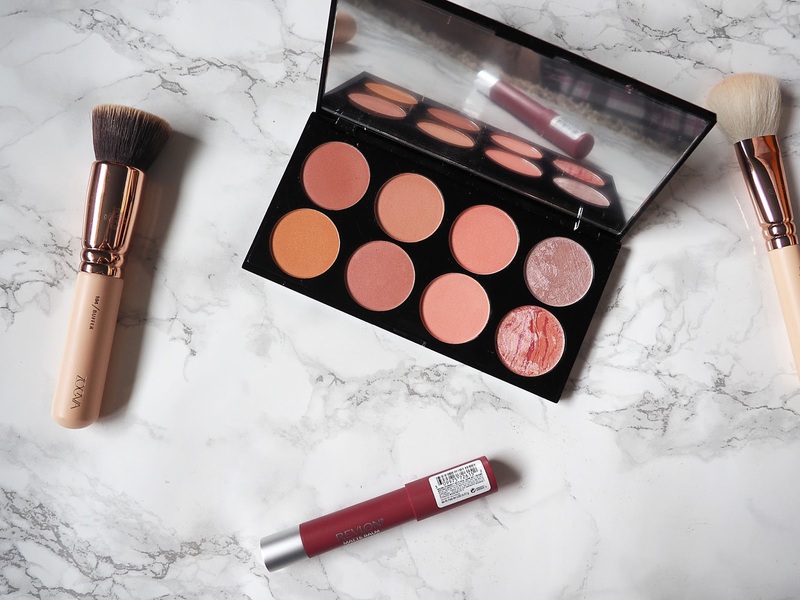 + Makeup Revolution Blush Palette - Hot Spice // £6 I'm such a sucker for a Makeup Revolution palette, along with 99% of the blogging community but one thing I have never owned before is a blush palette. This is a whole new concept for me, even though you can get a palette for practically anything these days, I'm slow at jumping on this bandwagon. 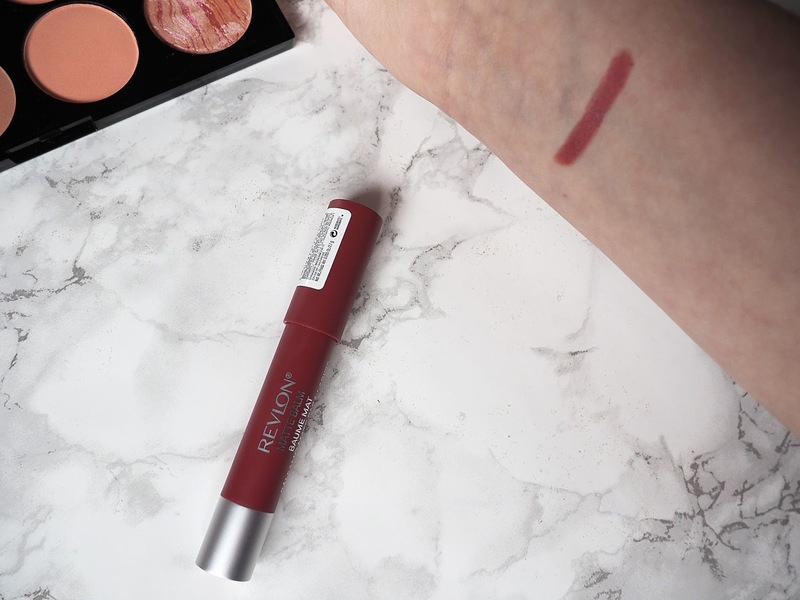 + Revlon Colorburst Matte Balm - Sultry // £7.99 Obviously you can't go make up shopping without adding a lip product to your cart, or is that just me? But that's besides the point, I absolutely adore lip crayons... The Revlon ones in particular. They are so quick and easy to apply, a win-win if like me, you're constantly in a rush doing your make up. And that's me not being able to afford anything for the rest of the month (along with paying off a holiday and buying a passport), but these products are totally worth it and as my ratings show, I feel they all live up to the hype. OH well that makes much more sense haha! I mean it rubbed into my skin fine anyway exactly like a primer. I'm curious to try the Revlon matte crayons! Currently I use the e.l.f. matte lip colors and like those a lot, but I haven't really used any other brands to see the difference. Also, if you are interested in exploring other foundations, I recommend L'Oreal Pro Matte! I just started using this one and looove it. It's lighter than Revlon Colorstay (which I used previously actually!) and blends really naturally. I haven't used anything by ELF in so long! They were one of the first brands I ever made an online order with too. All I can say is the Revlon ones are reallyyy good! Yes! Finally someone that feels my pain with the Age Rewind concealer being out of stock all the time :') Seriously where is the light shade at? Also sultry looks like a gorgeous colour, I own one of those and really like it :) even though you have to top it up, it's not exactly hard work doing so! Haha right?! I feel your pain. Haha me too! Like nothing was coming out at all so I got my mum to help me and it came out first time, typical. I recently got the Nivea balm and omg, I haven't been using any other primer recently (other than my Barry M Colour Correction one which I use WITH the nivea one so I have the colour correction and the staying power), it's the best thing I have ever used! I'm also a BIG fan of Revlon Colorstay but Ivory is a bit pink toned for me so I really need to purchase it in Buff which is my shade I reckon. It's my favourite full-coverage and long lasting foundation. Plus, my bottle of Ivory doesn't have the pump - super happy they finally added one! 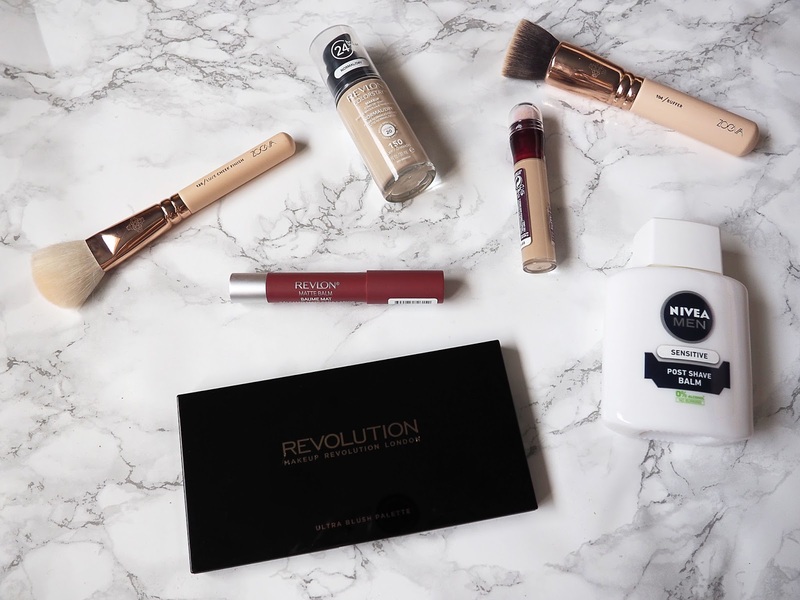 I also love the Maybelline concealer & Revlon matte balms, they were firm 2015 beauty faves of mine! It's such an amazing primer! Oo it's a shame you ended up with the wrong colour, I used this website called 'Findation' and it recommended Buff for me going off my previous foundation shades. Buff is the perfect match! I want to try EVERYTHING in this post now dammit. I'm finally going to be breaking my no-spend spree tomorrow and I will definitely be picking up the Nivea post-shave balm! Omg really?! That's such a lovely thing for you to say awh! This is amazing!! I'm so intrigued by the Revlon lip pencil. I think the color is gorgeous♥ Thank you for sharing!! Also I've been looking for a full coverage foundation that stays for a long time :) so yay! It's a beautiful colour isn't it? 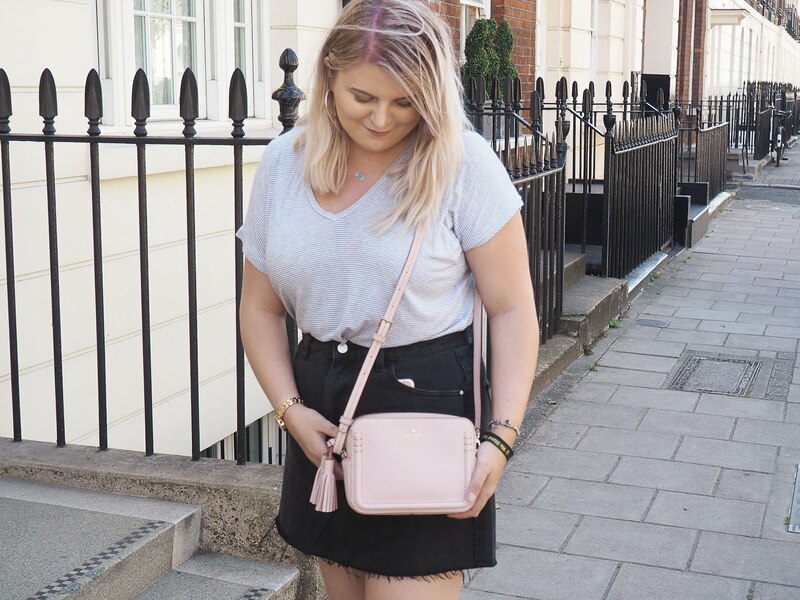 It isn't too dark either so it's wearable all year round! 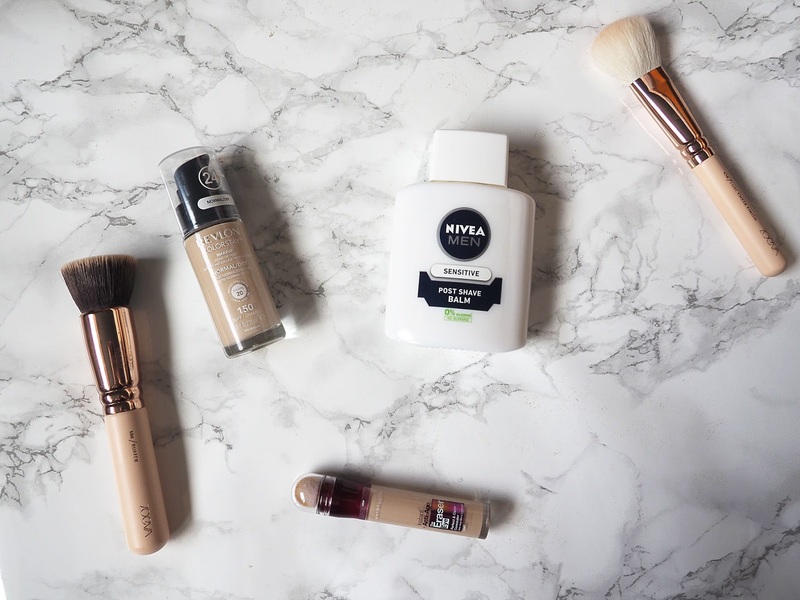 I'm loving the Nivea aftershave balm as a primer too - think it's taken the blogging world by storm! Lovely haul - you picked up some lovely bits. 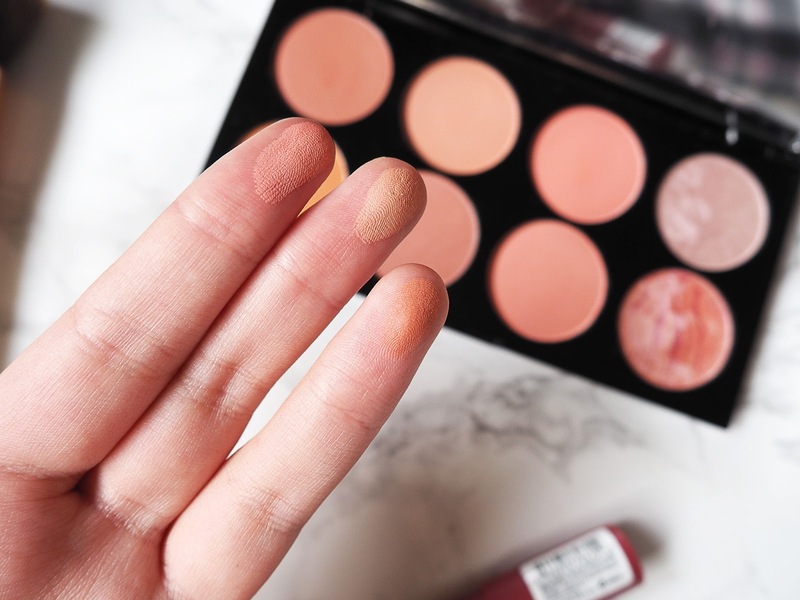 All your picks are amazing :) I love Makeup Revolution products, and this blush palette looks awesome. I also plan to buy the Colorstay foundation, but I have no idea what shade should I get. Maybe Sand Beige? Not sure yet. I'd like to try some of their face products next I think, try and step away from the palettes a bit! Ahhh that blush palette looks absolutely gorgeous! Is this the zoeva rose gold vol 2 brushes? That blush palette looks amazing! I saw it in Superdrug recently and managed to restrain myself but I think I'll be going back for it at some point. I love the blush palette too! I must get my hands on the post shave balm - everyone has been raving about it and because you've given it a 5/5 I must give it a try! Really want to try that makeup revolution palette now!! Looks so good! I really want to get my hands on the Nivea Post Shave Balm. I usually use the Body Shop Instablur primer but I've been wanting something a bit more moisturising for my drier areas. Ooh that lip colour is lovely! I really do need to grab myself some more lipsticks haha! nice information. Lipstick shades are really awesome. This is post is about great topic and it is about superdrugs but i want to say something as a healthy consultant you have taken drugs when physician concern or prescript you. Generic Latisse (bimatoprost ophthalmic solution) 0.03% is the first and best prescription treatment approved by the FDA for inadequate or sparse eyelashes, which can help people’s lashes grow longer, fuller and darker with Generic Latisse. Our Generic Latisse is authentic and genuine which is a prostagaglandin analogm, indicated to treat hypotrichosis of the eyelashed by increasing their growth including length, thickness and darkness. I read all the article it is the best for human. thanks for sharing me this type of important information. always maintain all the term which is depend all the basic regulation then you should maintain basic solution like Online Viagra 100mg.